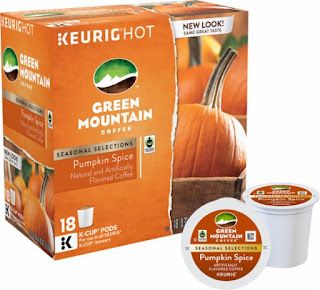 Stock up on K-Cups with either of these Keurig - Holiday Gift Tree Box (Multi Pack) - Red/Green $5.99 (Retail $12.99) or Keurig - Green Mountain Pumpkin Spice K-Cup® Pods (18-Pack) - Multi for $6.49 (Retail $13.99). Keurig Holiday Gift Tree Box (Multi Pack):Give the gift of a warm cup of coffee with this K-Cup and a Keurig single-serve coffee brewer. This K-Cup coffee variety pack is perfect as a hostess gift or to share around a holiday table. Enjoy this unique pumpkin spice blend of coffee with these K-Cup® Pods designed for use with the Keurig Single Serve Brewer.